Never struggle with your caravan again. Simply direct your caravan into any position required. Rotate the caravan through 360 degrees. Fingertip control going up hill and downhill. Enduro motor mover incorporate soft-start technology to give you ultimate control and pin-point accuracy. Power from our high torque motors is delivered through a laser cut, direct drive gearbox, which limits power loss and reduces noise and wear. Move any touring caravan; all at the simple touch of a button. The Enduro movers have a compact, lightweight steel body designed to be and easy to fit especially around suspension units. The lightweight cast-alloy rollers are fitted with patented, channel-cut design, enabling rainwater, grit an grime to simply disperse away for ultimate traction in all conditions with Lifetime Warranty. In order to protect your investment, the Enduro Mover uses triple-layered composite anti-corrosion technology. Simple single lever cross-actuation allows you to engage both rollers from either side of the caravan at the same time, useful when parking your caravan next to a wall or hedge. With a lifetime warranty on the rollers and an extended warranty on the moving parts, the Enduro motor mover is built to last. 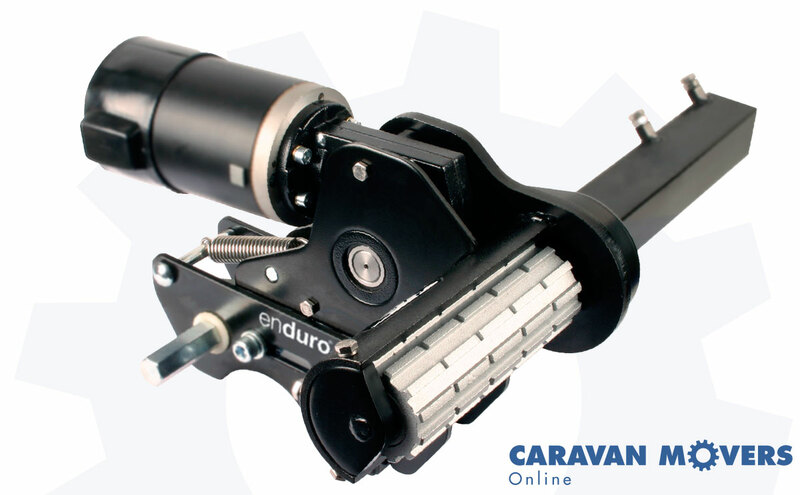 The Enduro Series 2 caravan mover represents excellent value for money being one of the cheapest mover we sell, but still offers excellent build quality and reliability. All Enduro Movers fitted come with a 5 Years PARTS ONLY Warranty. Labour is not included in warranty.